How often do you eat cranberries in their fresh, raw form? It seems to go without saying that sweetened dried cranberries have pretty well monopolized the Cranberry Market in recent years, edging out their plump, juicy originators by a long shot. I’d wager few of us ever go around eating raw cranberries as our go-to fruit of choice. As a matter of fact, when my six-year-old daughter saw them in our fruit crisper the other day and asked to try one, I told her to do so at her own risk. Raw cranberries are so stinking tart, they’re almost inedible on their own. Not surprisingly, it took about two seconds before she made a horrible face and spit it into the trash. Being a nutritionist, I’m a bit self-conscious about the food I serve when I entertain. Maybe no one is thinking about it but me, but I feel like my title obligates me to make at least some fairly healthy options for my guests. Plus, the nutritionist in me likes to offer allergy-friendly options for friends and family in the “something-free” club. This salsa fit the bill for both, since it’s vegan, gluten-free, dairy-free, soy-free–basically everything-free, since it’s made entirely with fresh fruits, sugar, and salt. Heck, it’s even RAW, if you’re into that, too. Oh, and it’s easy. And make-ahead. And a balanced blend of sweetness and spice. And seasonal. Can you tell I’m sold? Give this one a try for any upcoming Christmas parties and tell me how it goes! 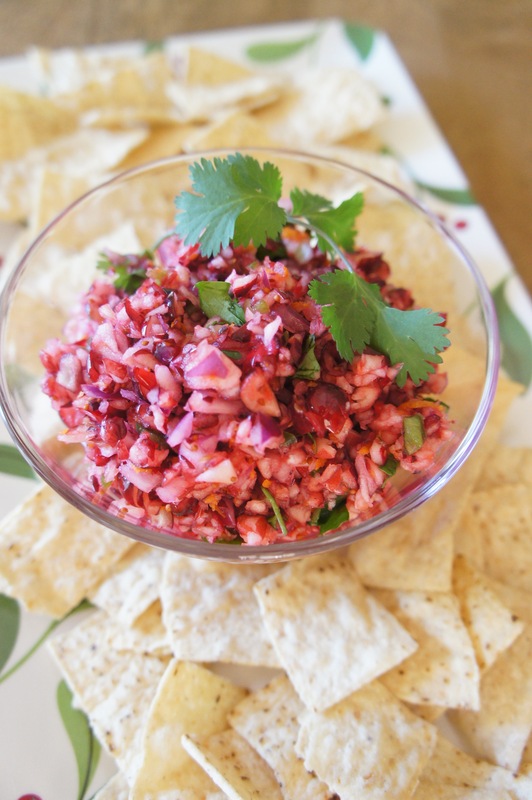 This Cranberry Salsa is a festive, healthy, allergy-friendly holiday appetizer. In the bowl of a food processor, process the sugar until very fine (to create superfine sugar). Pour into a serving bowl and set aside. Place cranberries, apple, red onion, and jalapeño in the food processor and process until the mixture reaches a finely chopped pico de gallo-type consistency. Add to the bowl with the sugar and stir to combine. Add orange zest and juice, lime juice, and salt and stir to combine. Cover and chill 2-24 hours. Stir in cilantro just before serving. Adapted from Home is Where the Boat Is, who adapted it from Southern Living.